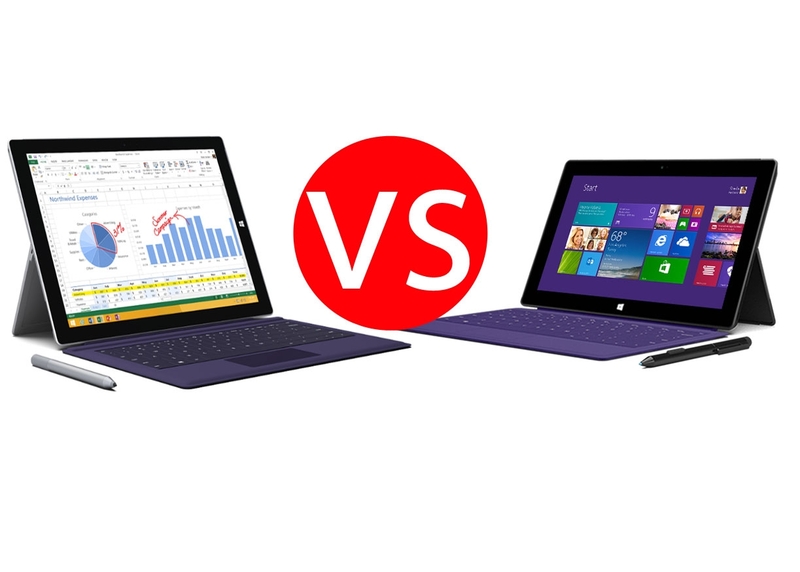 Both tablets are specialized in note taking, being two of the devices with the biggest screens. While the Microsoft Surface Pro 3 comes with an extremely powerful processor, the Samsung Galaxy Note Pro 12.2 comes at an affordable price and with a feature that you’ll love using: the S-Pen. We’ll throw our eyes on these tablets’ specifications in order to make a comparison between them. If you got bored of your old tablet and you’re looking to buy a device that offers a huge screen and a high resolution, then you can choose one of these 12-inch tablets. The Galaxy Note Pro 12.2 is lighter than the Surface Pro 3, weighting 1.66 pounds, while the Microsoft tablet is weighting only 0.10 pounds more. The Samsung tablet renders a higher resolution, but according to a review, the tablet’s PenTile display hasn’t made such a good impression. One of complaints against that Samsung tablet is referring to the lack of a built-in kickstand, but, unlike the Surface Pro 3, the device comes with a built-in storage for the S-Pen. You can use a Pen for the Surface Pro 3, but you’ll have to order a Type Cover that gives you the option to attach the Pen to the keyboard. Just like a sticker! Although the stylus created by Microsoft is a lot heavier and thicker, it has some interesting functions. Besides the fact that it writes smoothly, with it you can turn on your tablet with a click, and with a double click you can save a document. But when you pull out the Samsung’s S-Pen, the device opens (automatically) a note taking application. Only if you try both tablets’ styluses, you can decide which one is better, but, according to specialists, the Surface Pro 3’s pen is quicker. The Surface Pro 3 comes with three variants of Intel Core processors: i3, i5, and i7, offering you the possibility to choose between a tablet equipped with 4 GB of RAM, or double. On the other hand, the Samsung tablet does work pretty well with its 3 GB of RAM. The device comes with a Qualcomm Snapdragon 800 quad-core processor or an Exynos 5 octa-core processor. Unfortunately, if you want to perform more tasks simultaneously, this tablet runs slow and it’s very frustrating. So, the winner at this category is the Surface Pro 3. As for the prices, the Surface Pro 3 costs $799, but you can have a better experience using it if you buy a keyboard that costs $130. The Samsung Galaxy Note Pro 12.2 costs only $750, but you can find this tablet at a lower price on various websites. iPhone 6 release date nears, will iOS 8 support previous models? Samsung Galaxy Gear Smartwatch Phone – A Good or Bad idea? Let me help this bias author out: The comparison should have been made using the SP3 i3 64GB SSD versus iPad 64Gb and SGN-Pro 64Gb. I do believe the SP3 would still win handily. A worded comparative summary would look like this. 1) SP3 i3/64Gb can do ABSOLUTELY everything that either or iPad Air ($700) and SGN-Pro($1000) can do. 2) SP3 i3/64 GB Can DO LOTS OF MORE THINGS that both iPad Air ($700) and SGN-Pro($1000) CAN NOT DO “Run full fledge Desktop applications and games, I/O ports, use it as a mini thin client server etc”.